today at my sit spot, i didn’t feel like sitting still and watching. i felt like touching, and i also felt drawn to the ground. i slumped into a pile of leaves under my maple tree. i sat crossed legged and rooted around in them. and before i knew it, i was trying to find a leaf of every color. 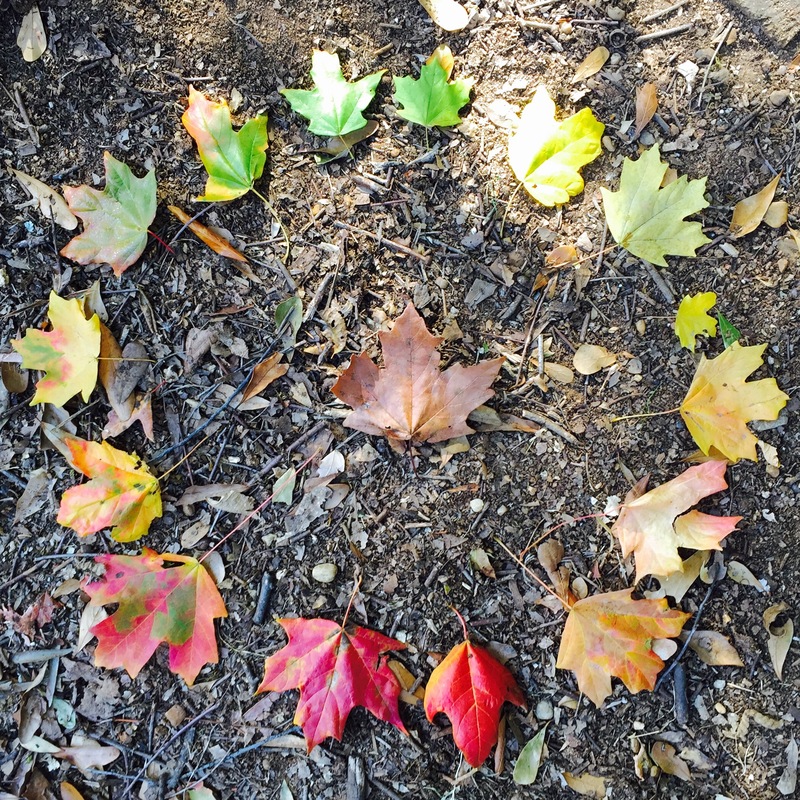 i cleared a space and started arranging the leaves i picked, in a circle of course. circles speak to me. i was a math student, after all. traditional meditation (sitting, eyes closed, watching the thoughts) is difficult for me, especially when i’m experiencing anxiety. i can get really caught up in how ‘bad’ i’m doing when my mind runs amok. i get bored. i talk negatively about myself, and how it’s impossible for me to commit to my practice. the worst part is, for an entire year (a whole year!) i forced this form of meditation on myself, believing it would somehow magically change me into a happy and joyful person. all it did was make me frustrated and eventually give up on the practice. one reason i love sit spot is that there are no rules. you can sit, you can wander, and you can play. you simply go outside and do whatever speaks to you, with a focus on pay attention. today, while my hands were collecting leaves, i guarantee there were no racing thoughts in my head, but i can’t prove it, because i wasn’t paying attention to my thoughts. i was paying attention to the colors. i was feeling the leaves in my hands. i was examining the awesome little blocks of cellulose in between the veins. i was 100% present. i can’t say that about any time i traditionally meditated.